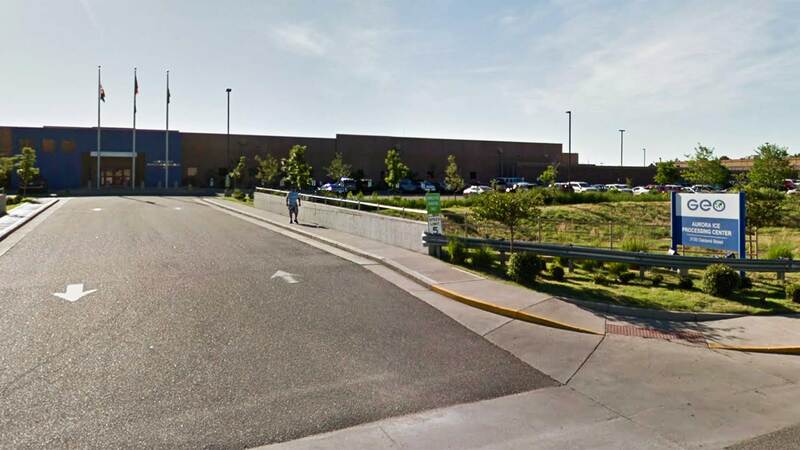 / Modified mar 12, 2019 3:14 p.m.
Google Street View image of the entrance to the GEO Group's immigrant detention facility in Aurora, Colorado. PHOENIX — Over 2,200 people exposed to the mumps virus in at least two immigration detention facilities have been quarantined, authorities said Tuesday. Mumps is extremely rare, and infections have dropped by 99 percent since vaccinations began in the late 1960s. It can spread quickly through coughing, sneezing or even talking. But immigrant advocates have long said that medical care at immigration detention facilities is subpar, and they've filed several lawsuits. Jordan said the Aurora location has a call system attorneys can use to reach detainees. ICE has not answered questions about how detainees who are quarantined can reach their attorneys or what happens if they have a court hearing or are scheduled to be released.